Crosswords have been the world’s most popular puzzles for over 100 years. 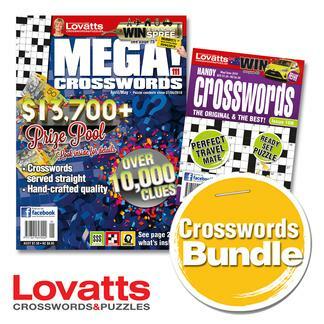 Enjoy classic giant crosswords in Lovatts MEGA! magazine and on-the-go fun in Handy Crosswords. Both titles are designed for your enjoyment with top-quality clues to everyday words plus a few tougher crosswords for those who love a challenge. Good delivery service, love the puzzles have been doing lovatts puzzles for years.